Fiddle While You Burn™: SXSW 2008: Badges? Badges?! We don’t need no steenking badges!! - "Independent Music Photography"
SXSW 2008: Badges? Badges?! We don’t need no steenking badges!! Plane ticket? (check), Hotel Room? (umm..), Festival Badge? (well... see, what happened was...), Wristband? (maaaybe, are they free? ), Crazy long list of fun & free stuff going on at the festival? Right here. If you’ve already sprung for a badge (or wristband) for this year’s South by Southwest music festival in Austin, TX it might be worth it since there’s tons of excellent badges only shows going on. But if for whatever reason you don’t have any festival bling, no worries - there’s still plenty of action to take in with no passes required! This FWYB posting will be listing all of the SXSW related showcases, parties and after parties that come in over the next few days that are free and/or don't require a badge or wristband for entry (a couple of other good resources are Donewaiting, and Austin Showlist). If you're coming in from outside the city Yaris has an interactive map for getting around. There's no way for me to actually do all of this stuff but this year I'm gonna just kind of float and see what happens. So if you see me zipping around with my camera, holla! Bookmark & keep checking this page as it will be updated multiple times daily with new info! Party co-sponsored by Fuel TV as well, so expect lots of lovely freebies as well as drinks and stick-to-your-ribs Tex-Mex. 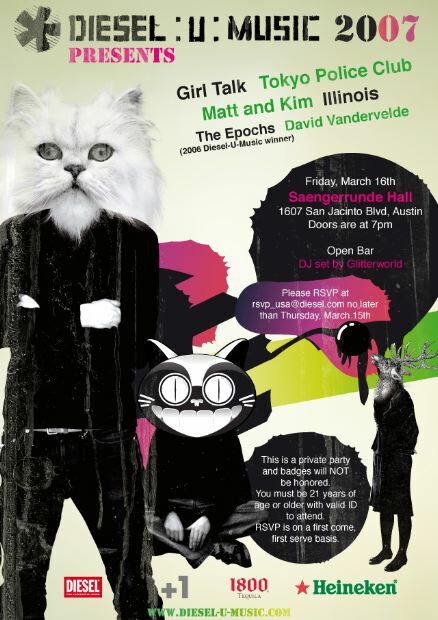 Performances by: Kingfish, Moto:Rosa, Elevator Action, The Sammies, The Houstons, Alternative Champs. The Girls are Representing… *Free manicures & beauty treats all day! The entire 8-hour broadcast and the live performances are open to the public, limited to a first come first served basis only. If you plan to come to view a live band please arrive and be seated at least 10 minutes prior to the scheduled time. The Austin City Limits studios are located at KLRU TV. HELIO presents the IHEARTCOMIX + VIVA LA ROCK AUSTIN KICK OFF!! @ SUPER!ALRIGHT! ed note: You absolutely have to check out Flatstock its one of the coolest parts of the festival! Eastern Conference Champions, Manic, Meriwether, The Pink Spiders Robert Fortune Band. 12:00 PM http://www.vicesavestexas.com/ - Stubb's(Vice party - invite only) All Ages FREE! complimentary beverages and other goodies. We're @ The Scoot Inn (formerly Red's Scoot Inn) (1308 E. 4th Street) in Austin, Texas on March 15, 2007 from 11:30 AM to 6:00 PM, This party is 100% FREE! - no badge required - no RSVP - first come, first served. PUSH PLAY Episode 2 @ Red 7(Baeble Music / Bust Magazine) Not Specified FREE! 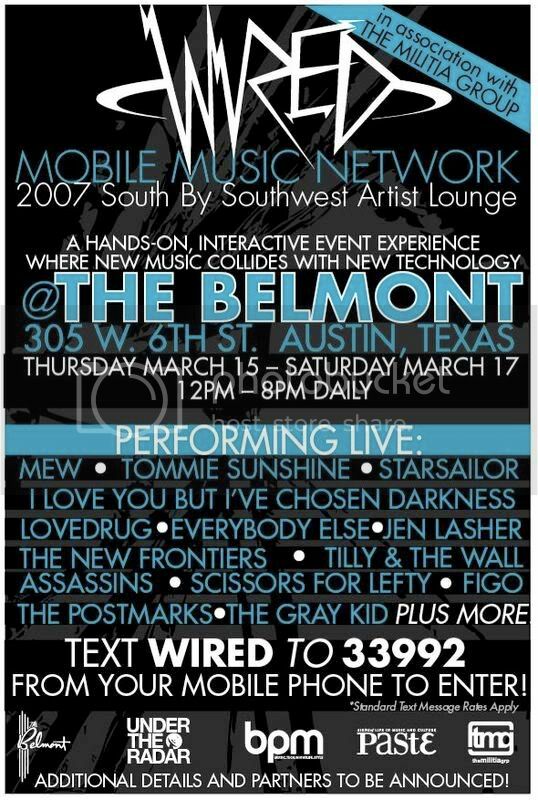 Bring your SXSW badge or wristband for FREE! beer! along with special live performances by. Featuring performances by 1:30p Earl Greyhound, 2:15p The Comas, 3p Scissors For Lefty, 3:45p Great Northern, 4:30p Oh No! Oh My!, 5:15p Margot & The Nuclear So & So's, 6p Sloan and 7p Midnight Movies. Les Savy Fav, The Black Angels, The Gossip, Dead Meadow, Erase Errata, David Vandervelde, Matt & Kim, Dead Meat, Danava, Brother Reade, Spindrift, etc. Refreshments provided by St. Arnold Brewing Company. No wristbands necessary. All events subject to room capacity. [ MS BEA'S ] -- ALL PARTIES 'R HERE -EXCEPT- LATE LATE THURSDAY! just walk 2 blocks East on 6th! ALL AGES 512.481.9725 FREE! ! RSVP to attend PureVolume events Indoors, Where to be:E 2nd & Trinity FREE! beer! WHERE: Cream Vintage (outdoor lot), 2532 Guadalupe Street, Austin, Texas COST: FREE! ! Fashion Events and Rockstar DJ Sets DJ Sets by Har Mar Superstar, A Touch of Class, Lucero, Death Disco, DJ C-Town. Modular Records Happy Hour. Crate Denim Trunk Show, with Dirty Librarian Chains at FactoryPeople from noon to 6 p.m.
Complimentary Cocktails and Beer, Sephora Makeovers, FREE! . 11:30 AM http://www.messwithtexasparty.com/ @ Red 7(Mess With Texas hosted by Patton Oswalt), All Ages 611 East 7th Street All Ages FREE! Text WIRED to 33992 for VIP access, contests, and updates! Good luck everybody & have fun. One piece of advice: It's better to find a solid line-up where you can chill & enjoy the music with a cool drink instead of constantly having to bounce from spot to spot. Any "Rock the Rabbit" info?